Still etched in my brain was the great income trust debacle that took place on Halloween of 2005. The Canadian conservative government won re-election promising not to change the tax preferred treatment of income trusts. That promise was broken and Canadian investors lost billions of dollars overnight. The value of my income trust holdings fell by 40% instantaneously. Needless to say, as an investor in U.S. stocks, failure to appeal and replace Obamacare (ACA) makes me very nervous. Trump’s promise of massive tax cuts and infrastructure spending will need support from the Freedom Caucus (tea party) who want a border adjustment tax to offset some of the loss revenue. There is also a complicated Senate rule that would prevent Democrats from blocking the tax bill. Under the rule, the bill cannot add to long-term budget deficits. That means every tax cut has to be offset by a similar tax increase or a spending cut. Nevertheless, Treasury Secretary Steven Mnuchin said Friday the administration plans to turn quickly to tax reform with the goal of getting an overhaul approved by Congress by August. House Republicans have released a blueprint that outlines their goals for a tax overhaul. 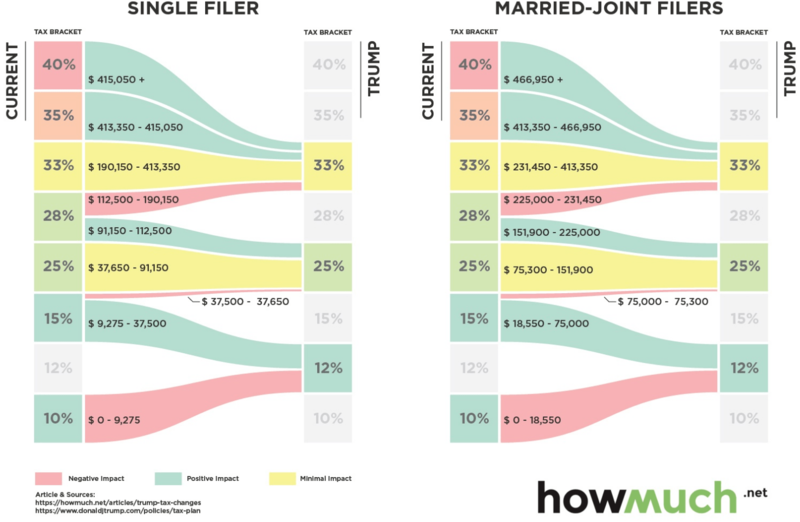 It would lower the top individual income tax rate from 39.6 percent to 33 percent, and reduce the number of tax brackets from seven to three. The House plan retains the mortgage interest deduction but repeals the deduction for state and local taxes. However, nearly 34 million families claimed the mortgage interest deduction in 2016, reducing their tax bills by $65 billion. Also, more than 43 million families deducted their state and local income plus personal property taxes from their federal taxable income last year. The deduction reduced their federal tax bills by nearly $70 billion. The general goal for Republicans is to lower income tax rates for individuals and corporations and make up the lost revenue by reducing exemptions, deductions and credits. Overhauling the tax code is actually hard because every tax break has a constituency and the biggest tax breaks are among the most popular. Over the past week, some investors are starting to doubt that the tax cuts will get passed. The value of the U.S. dollar has weaken and ten year bond yields have fallen from 2.62% to 2.4%. Eight of the ten sectors that make up the S&P 500 were negative for the week. The biggest losers were U.S. financials (-3.72%), energy (-1.78%) industrials (-1.75%) and materials (-1.3%). There is a lot of money on the sidelines that missed the Trump rally and are waiting for a stock market correction. I took some profits before the Canadian federal budget that hinted at tax increases so I also have some money to re-invest. The Canadian conservative government taught me a valuable lesson back in 2005. What government promises to do and what they actually do can have a negative affect on your investments. 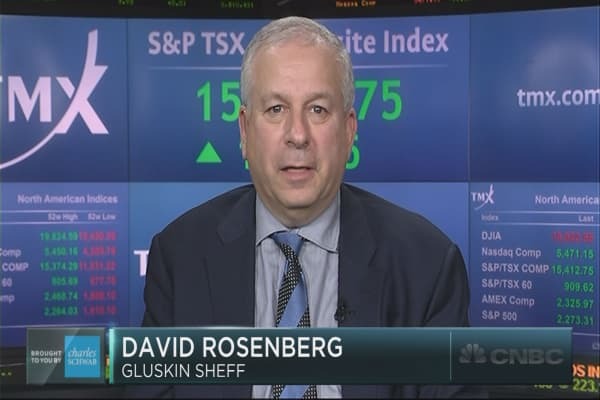 David Rosenberg is chief economist with Gluskin Sheff + Associates Inc. and author of the daily economic newsletter Breakfast with Dave. Here are my 10 reasons to be cautious on equity markets right now. Trailing and forward price-to-earnings multiples are now in the top quintiles historically and the most expensive in 15 years. Only in 1929 and the “Dotcom” bubble has the cyclically-adjusted multiple (CAPE) been as high as the case today. We are heading into the ninth year in the cycle and have logged an epic 250-per-cent surge in the process. As retail investors now plow in to this market in the late innings, one could legitimately ask what it is they could possibly know that corporate insiders do not, considering the latter have been selling their company’s stock this year at a pace not seen since the data began to be published in 1988. U.S. margin debt has surged at a 27-per-cent annual rate since immediately prior to the election to stand at $513-billion, the highest level on record (eclipsing the high from April 2015). After an eight-year hiatus ($200-billion of net outflows), private clients have thrown in the towel and plowed nearly $80-billion into mutual funds and ETFs since the November election. Remember Bob Farrell’s Rule No. 5: “The public buys the most at the top and the least at the bottom”. For the past four sessions, we have seen more new 52-week lows than new highs (the longest streak since Nov. 4) — a technical sign of a toppy market. Moreover, the Russell 2000 index is now flat for the year and off 4 per cent from the high — again, we know from history that the generals tend to follow the privates. Tack on the fact that the S&P 500 recently traded as much as 10 per cent above the 200-day moving average, and we have a market ripe for a near-term correction. From a VIX of 11.9 to nearly 60-per-cent Bulls in the Investors Intelligence poll — though this has begun to roll off its highs in a sign of the “smart money” beginning to take profits. The S&P 500 has gone 57 days without so much as a 1-per-cent intraday swing, something we have not seen in at least 35 years. The proverbial calm before the storm. The front-end Treasury yields are rising discernibly — the two-year T-note yield has gapped up to nearly 1.4 per cent and futures market is in the process of pricing in an extra two rate hikes after the likely March tightening (the overnight index swaps market currently has priced in 70 basis points of tightening by year end). The Fed has met its twin objectives and the fed funds rate consistent with that is 3 per cent, not the 0.75 per cent currently. By the time the Fed reaches that level, the yield curve will likely have inverted long before and that’s when the clouds will come rolling in. This could be next year’s story, which means a forward-looking market begins to discount this prospect sometime later this year. Cyclical price pressures are showing through, with the core PCE inflation rate at a 30-month high of 1.738 per cent year over year. As was the case in 1990, 2000 or 2007, this likely is not sustainable, but is a classic late-game signpost nonetheless. All one needs to see is the latest blow-off in the commodity complex, which is now on pause, to notice how late cycle we are. Remember what oil did, for example, in 2008? The survey data are at extremely high levels at a time when actual economic growth is running barely above a 1% annual rate. Gaps like this, once again, are classic near-end-of-cycle developments. The prospect of there being huge disappointment over the pace of policy change in Washington is also very high. While households were not net buyers of equities until very recently, the near-quadrupling in the stock market has still boosted their exposure to a 21.1-per-cent share of total assets. Only five times in the past 16 years has the share been this high or higher — this is 42% above the norm. Bonds lead stocks, just know that. And the risk-premium on U.S. high-yield corporate bonds very recently approached lows for the cycle at a super-tight 335 basis points. However, they now are widening again, and with the overall narrowing path of the Treasury curve, this is well worth monitoring for those equity investors who are still long this market. Nobody ever lost money by booking a profit, especially for a cycle that is now heading into year number nine. Do you think that David is right? Being Canadian, I am worried about the Federal Budget scheduled for March 22 because there are rumours of an increase in the capital gains tax. I have been taking some profits in my taxable accounts and for investment club just in case. I do believe it is impossible to time the market so I am still fully invested in my tax sheltered accounts. I`m a National TV News producer at the CBC and I just read your article “Why I quit being a financial Advisor” we are working on story about the trend away from “active investing” to more “passive investing” and think you might be a unique and interesting voice in our item. Can you give me a quick ring so we can have a chat? I immediately gave him a call and answered some questions about my views on both active and passive investing. He asked if I was willing to be interviewed at my home which I agreed to but I wasn’t given a confirmed date. Please reframe from making any comments on my golf swing! It has been three months since I swung a golf club.